The movie itself is available on iTunes! Production company, Triple Take Productions. Licensed to SPACE (the short version AND the feature film version) from 2004-2007, Drive-In Classics (short version) and SCREAM (short version) from 2003-2006. 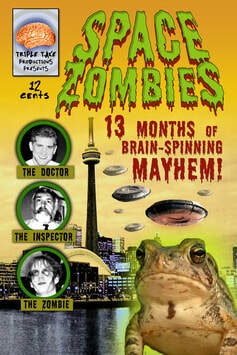 Screened at the Bloor Cinema in Toronto in September 2004. Screened at the University of Toronto Film Festival in March 2005. Currently distributed by distribber. Previously distributed by Hiltz-Squared Media. Forward: Space Zombies: 13 Months of Brain-Spinning Mayhem! is a feature film shot on digital video that pays homage to B-Movies of the 50s, 60s and 70s – in particular the films of Edward D. Wood Jr. Though unintentional, the idiosyncrasies and errors that go into these ‘terrible’ but endearing and highly enjoyable films have created a style and a cult following. It was the filmmakers’ desire to delve deeper into this style through the making of a parody film that emulates B-Movies down to the last detail, but within a modern context, as if created today. The result is a hilarious film study, both entertaining and enlightening. There is a definite art to creating something ‘bad’, particularly if you are doing it on purpose! Synopsis: (Sci-fi/Comedy/B-Movie Horror) Even the sanest and kindest of men goes mad. But what is it that drives him to insanity? What you are about to read is a description of the circumstances under which one man, Veterinarian Dr. Vic McNaughton, goes horribly, horribly, and irretrievably mad…is it the aliens seeking human brains for snacks? Zombies seeking to switch their brains with the brains of cats? Monster toad beasts? Starfish mutations? Dr. Vic and his staff experience all of these adventures, but it is the Space Zombies’ experiments switching the thought essences of Dr. Vic’s wife Betsy with those of his beloved cat Ju-Jube that eventually push him over the edge. His solution is obvious – his wife and darling pet must be combined, but first he must test his theories on some other unsuspecting humans and cats. What results is a truly terrifying travesty – a duel-headed cat freak that defies his master and embarks on a frightening rampage. It is only through this cataclysmic event, along with the prodding of Vic’s staff and his friends, including the very Space Zombies who helped him create the two-headed creature in the first place, that finally snaps Vic out of his maniacal trance, and he begins to see the light. Only when things are put right again – when minds and bodies are matched, does Dr. Vic’s world simmer to a sane temperature again.